I’ve been in Haiti for just over five months. There has been so much to learn, experience, and appreciate on this little Caribbean island. Initially it seemed overwhelming: there were just so many new things to come to understand. From language to public transportation to cultural norms that just are not that normal to me, it felt like an impossible mountain to climb. But little by little things started to make sense. I climbed that mountain, and several other very real, rocky, and steep mountains. The pieces that were to become my life here just fell into place. 1. A traveller’s notebook is essential for things like writing down people’s names, that street with the store with the shirt you liked that you passed on the way to the grocery store, and words you see that you want learn in your new language. 2. An artisanal pen cup adds local color and is a great place to keep your pens. 3. As a photographer, a camera can come in handy sometimes. 4. A coral? Found on the beach makes a great place to hold change for the tap tap (you’ll learn about those in the article), and house keys. 5. If you have a lot of files, an external hardrive is key. It’s also great for keeping things like all nine seasons of the Office on it. I don’t know. 6. Multiple writing utensils, peak the MCC paraphernalia. 7. A letter from home. 9. A trusty dictionary to help maneuver language troubles. 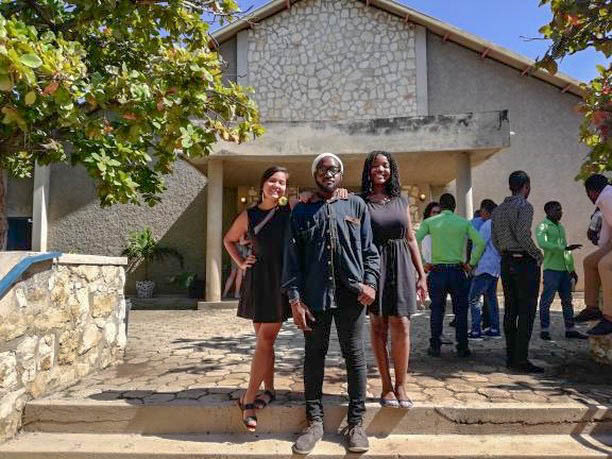 The whole reason why I’m here in Haiti is to serve in the position of the Communications Assistant in the MCC office and with SOFA (Solidarity with Haitian Women by its initials in Haitian Creole), one of MCC’s local partners. I could never have asked for a position that fits better with my passion and skills. Some of my responsibilities include writing articles about project visits, taking photographs, managing the social media accounts for our office, and accompanying the website redesign for SOFA. It has been work that I enjoy doing and really care about. Working directly with partners and projects and seeing how all the pieces fit together for myself adds a very personal aspect to the work and I get to really enjoy it. I got my degree for communications just last spring and I have really been able to utilize what I’ve learned and get better at what I do in just a few short months. Here with MCC in Haiti I have already been able to grow so much. I love what I do and that it’s all in the service of the local partners that MCC supports in Haiti. It’s work that I am very proud of and will be able to learn from for a long time. A tap tap waiting to get filled with customers and set off on the route. Back home in rural Pennsylvania, public transport was not something I thought about often. I took an Uber one time and I’d call it a four-star experience. Since coming to Haiti, I have taken much more public transportation. One of the ways I can get to work in the morning is the tap-tap. These are brightly painted, covered trucks with a designated route. You pay 15 HTG, which is about 20¢ USD, to ride almost any route from start to finish. Another option to get to work, or anywhere else, is a motorcycle taxi. Drivers stand with their motorcycles at stations throughout the city, and you can ask them to go exactly where you need to. This method is more expensive but much more direct than a tap-tap. Both modes of transportation have been new and have been equal parts thrilling and terrifying. Even though I’m used it now, riding on the back of a moto through Port-au-Prince’s hills and valleys has not gotten any less exciting than the first time. A verse that I find myself reflecting on comes from Hebrews 13:14. “For here we do not have an enduring city, but we are looking for the city that is to come.” I think we can all imagine a physical city or place that can use improvements, a place where there is a lot of potential. Maybe if we think of ourselves as a city, with bustling thoughts and skyscrapers of emotions, we can recognize that that we are improving every day. After Sunday service with a few friends. I have had many experiences with different churches in Haiti of many denominations and sizes. I can’t imagine another country that worships the Lord as fervently as Haiti. Any church, no matter the size, is as loud and vivacious as the next one. Out of all these wonderfully diverse places of worship, Quisqueya Chapel is the one I have chosen to call my home. It’s an English-speaking church with a few hundred members about fifteen minutes away from my home if you take a tap-tap. What I love about it is the emphasis on music during the service. Worship songs have always been my way of connecting to the community. Being able to sing my favorite songs has helped me keep that relationship strong in a new context. There have been so many fun things to do but swimming has been my favorite Caribbean island activity. In a country of endless summer, there is always an appreciation for a dip in cool, fresh waters. From where I live in Port-au-Prince, I’m able to go to the beach on long weekends, find natural waterfalls and basins, and visit pools at hotels or friend’s houses. This Christmas I traded white snow for white sand and traveled to Taino and Kokoye Beaches with some fellow MCC service workers. We brought tents, towels, and sunhats and what awaited us was coral, boats, and sunshine. There were plenty of adventures and it was a very merry Christmas. I snorkeled for the first time and it was amazing! We ate fresh lobster, fried plantains, and avocados on the crystal-clear beaches of Southern Haiti. It was hard being away from home and my family for the holidays. I really missed them, but out of all the places to be apart from my loved ones, a Caribbean island is not a bad option. The views were incredible, and the natural beauty of the beaches and mountains was breathtaking. Island Christmas is an experience I won’t forget anytime soon. I’ve learned a lot in the past five months: not only a new language culture, but about myself and what my passions are. There is an unquantifiable amount of connections to make between peoples and cultures. All people create, imagine, care, and laugh, and at the end of it, all people are people. Tout moun se moun is a Haitian proverb that means all people are people. Not everything is perfect: sometimes I end up taking a tap-tap going the wrong direction, or I really say the wrong thing and almost end up with a fish when I really wanted the dinner check or the other time when I just wanted a soda. But I can walk away from every cringey moment with a smile and a funny story for the people back home. I’m halfway through my term as a SALTer in Haiti. I feel like I’ve already had the experiences of a lifetime but there are more to come, and I’m ready for them. Sometimes it feels like the time is going by so fast and sometimes it feels like I hit pause on the last day of summer and got to stay there. In the next five months there will be pits and valleys but what follows is always a peak and another and another. There are mountains beyond mountains, deye mon gen mon. All in all, I am incredibly grateful for this opportunity to grow like plants do in this tropical climate: very quickly and in all directions, but ultimately facing the sun. The view of uptown Port-au-Prince from the rooftop.